Currently, we only allow blocking users based on IP addresses. Blocking is available on every plan. From there, click on "Block User"
This can have unintended repercussions, for example you may block a former teammate by public IP and block everyone in your organization because you are seen as having the same IP address externally. Great, now they're blocked, but let's get the facts straight: what does this really mean for your experience and theirs? Once you block a user a customer tag will be added automatically to the user labeled [Blocked] so you can create a filter of everyone who you blocked. You should also be able to view it from within your Inbox and Conversations view as a Custom Filter. 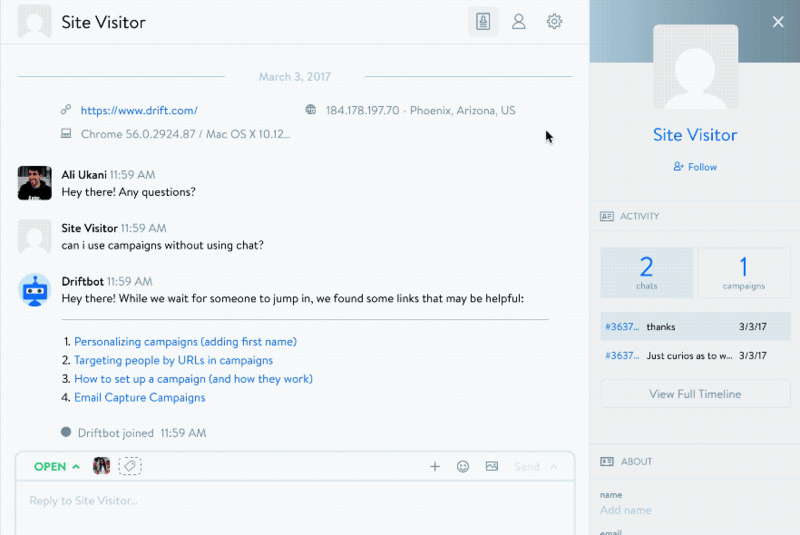 As soon as a user is blocked, they will no longer be able to send you messages through Drift. However, they will still see the Drift widget, but if they try to send a message, it will not go through. Instead it will appear to always be "Sending..."
Please note that blocked users will not usually realize they are blocked because they can still see the Drift Widget and Playbooks. They won't be able to successfully send messages either. The Blocked tag will only show when you filter contacts if you had their email. Otherwise, you can't filter Site Visitors into Contact segments because they were never actually contacts. You can unblock a contact at anytime by following the exact same steps as blocking them - the option will now be to remove the block. It's also important to note that some regions of the world have a limited number of IP addresses, so blocking one IP address can block more than the one intended. Questions? Concerns? Chat with me now or email support@drift.com.